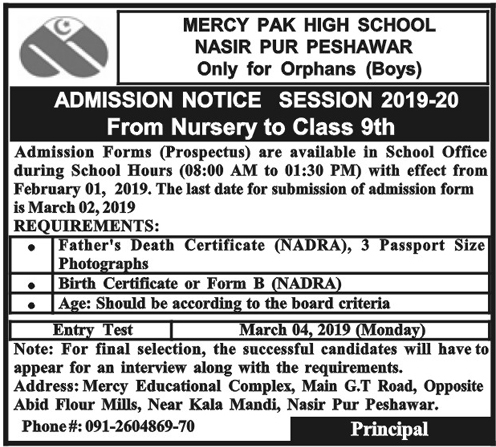 Mercy Pak high School Nasir Pur Peshawar offers free of cost education from nursery to 9th class to needy orphans (Boys only). It covers tuition fee, uniform, textbooks, food, accommodation, and much more. The last date for the submission of form is 02-03-2019. Admission forms are available in the school office during working hours till 2nd of March 2019. Address: Mercy Educational Complex, Main G.T Road, Near Kala Mandi, Nasir Pur Peshawar. For more details scroll down to the image below.